Obviously the best kind of system would be a CHP system, a combination of heat & electrical power output. When converting LENR heat to electrical power, an efficient conversion is required to make it worthwhile since it already takes electricity to power the LENR reaction in the first place. 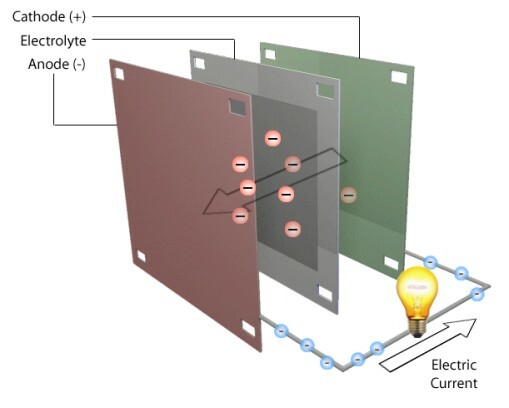 For example, with a COP of 6, an LENR unit can convert 1.6KW of electrical power input to 10KW heat output. A system with 10% efficiency will then convert that heat to about 1KW electrical energy, which is useless unless some of the heat is also being used for other things such as heating, cooling (yes, cooling) & cooking. Below are 5 examples of energy generation systems that could be used to produce electricity from LENR reactions. Randell Mills’ brainchild. 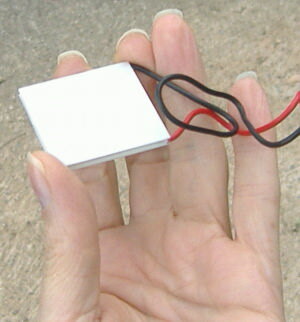 A method of generating electrical power from water vapour. Blacklight Power has announced the achievement of the generation of Megawatts (MW) of power from the conversion of water fuel to Hydrinos, including an independent offsite validation of its electrochemical cell. This is big news. If it is all true and the power output can be maintained, then there won’t even be any need for discussions about LENR electricity generation. The CIHT will win hands down. They will hold a live demonstration of their device on January 28th at 11 AM. Those interested in attending can contact BlackLight to preregister for this limited availability event. The Tesla turbine is a bladeless machine that can be used in the same way steam turbines are used but on a smaller scale for homes. It can simply be used to boil water, creating steam which in turn will drive the rotor disks. The Tesla turbine can easily reach an efficiency of 40% without any advanced modifications and has a high power to weight ratio (a 10 pound unit can produce over 20KW). Invented by Nicola teslka in 1911, this turbine failed to compete with other turbine and engine technology because of a number of reasons; the rotor disk material was not strong enough to withstand the high RPMs, the engine has low torque and was therefore inadequate for locomotives, as well as a little sabotage from competitors creating bad publicity. The materials conundrum has largely been overcome, however, and for electricity generation torque is not a factor. With an efficiency of about 20 -30%, this relatively silent engine could be used to produce up to 3KW of electrical power from 10KW LENR units with CHP. Which is more than enough to power an entire home’s lighting, TV, stereo, computer, & other electronic gadgets. It is a an efficient, well established technology; Submarines have actually replaced their nuclear power generators with Stirling engines producing 100s of KW, and the Solar industry is beginning to use the engines for conversion of heat to electricity on their parabolic mirrors. It is also being considered for hybrid electric vehicles as torque is not the most important factor in a hybrid car, rather electric power is the goal. 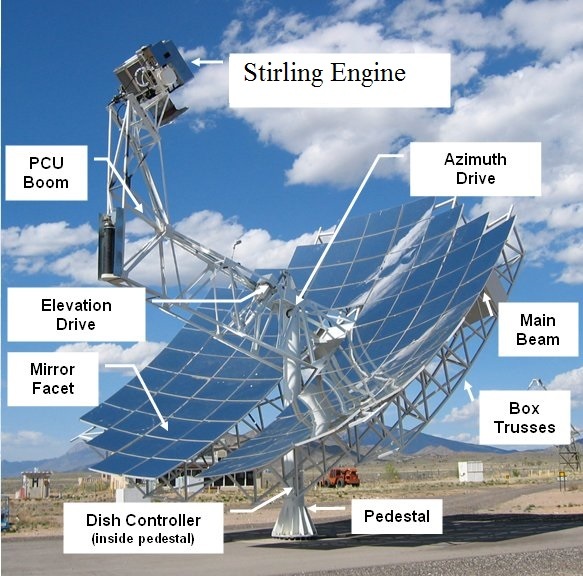 Compared to the conventional internal combustion engine, the Stirling engine is much easier to manufacture but has a lower power to weight ratio due to the increased size required by the heat exchanger. It is an external combustion engine that can work off of any energy source, LENR, solar, firewood, coal, diesel, you name it. Anything that makes heat can power a Stirling engine. Unfortunately it can be susceptible to explosions if the wrong gas is used, such as oxygen-containing air or hydrogen. However Helium and Nitrogen are safe alternatives. High gas pressures are also required for higher power output but, conversely, the higher the pressure the greater the possibility of gas leakage hence requiring more complex sealing. Additionally, the higher the pressure, the higher the temperature required to start and maintain the reaction. An established and well understood science used by NASA for all it’s unmanned space exploration. It is the direct conversion of heat to electricity using the Seebeck effect. NASA uses RTGs but LENR would work just as well. It has a 5 – 10 % efficiency which is still fine if CHP is used, considering that a 10KW home LENR unit will provide not only heat for your stove and geyser (80% of electrical energy needs in any home) but will also provide an additional 500W of electrical power, enough for the lighting, TV, & sterio, assuming 5% efficiency. Has no moving parts and should be easy to manufacture. Suffers from the problem of size. A 50 kg (110 pound) unit produces only 300 watts, so it’s possible the aforementioned 500W may not even be attainable. Also has high operating temperature requirements while at the same time high temperatures reduce the lifespan of the device. The majority of the world’s electrical energy is produced using this method in giant dynamos or alternators. Defkalion, one of the leaders in the LENR space, have observed huge electromagnetic fields inside their reactors. This entry was posted in Uncategorized and tagged CIHT, LENR, Stirling, Telsa Turbine, Thermoelectric. Bookmark the permalink. 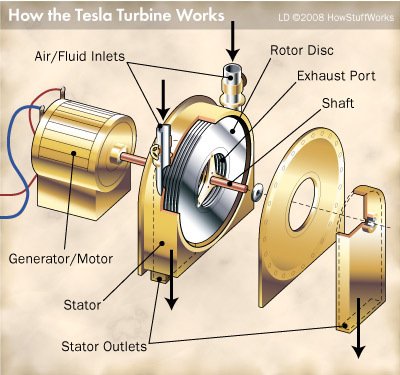 Tesla turbine are in my opinion an interesting option, since they should be simpler, cheaper, despite less performance… but LENR heat is so cheap and turbine so expensive that price is a bigger problems. for CIHT, I’m very skeptical on Blacklight technology…. if it works, it would be great. Blacklight piower is most likely not just pulling our leg. Impovements in thermo-electric conversion are emminent. In light of this, one could venture to say that the Borealis proposal to the LENR energy community, at an impressive 50% to 80% thermal electric conversion, is like a precious energetic gem of amber (elektron). I’m a bit skeptical of Blacklight as well but their Jan 28 demo should alleviate all our concerns. Hopefully. Bolearis on the other hand doesn’t excite me one bit. They don’t look legit. But time will tell. With a low COP, the best method would be a hybrid solution. Just generate steam using eg. gas or oil and use (multiple) LENR devices to pre-heat or after-heat the steam (depending on the maximum LENR reactor temperature). This would greatly increase the efficiency of the whole unit. Obviously you use a turbine-generator combination to make the electricity, which (partly) also can be used to control the LENR reactors. For up to date excitement in advanced thermoelectric, a good read. Efficiencies are about to go through the roof! Borealis may likely become one of the leaders in the field. The success of LENR energetics lies within solid state, nuclear confinement/excitement, and nano science. The Borealis Group is extremely knowlegable in all of these arenas. I would point out two matters. Rear Admiral Stiegle has access to information that you don’t. Harold Aspden has provided very relevant insight that Mr. Steigle is most likely aware of. Advanced thermo/peizo electric science is clearly a sister field of cold fusion. The Borealis Group is extremely legit. Why do you ponder otherwise? Any reasons you present will be considered as legitimate after confirmation.